As a tattoo artist, you have many items making up your studio (no matter how big or small it is) and you also have a lot of things to tackle—from tattoo idea inception to execution. We thought we’d make your life a little easier by recommending some quality tattoo artist supplies for everything from the doodling phase to the stencil transfer phase. After all they say tattooers are only as good as their tools. Most times, the best artwork and your most memorable ideas can appear out of a simple doodling session. Often times, doodling or simply leisurely sketching can relax you and really help in bringing out the most creativity that packs a solid punch. Don’t let subpar tattooing pens or pencils get you down. When searching for drawing utensils, you want to keep in mind three things: ink/lead quality, feed and the barrel diameter. The ink or lead quality will allow seamless sketching. The feed, like ballpoint or fountain, will affect the flow of ink to paper. Lastly, the barrel diameter will determine how comfortable your grip around it will be. You don’t want supplies that will interrupt your process aka pens that bleed too much, pencils that don’t have the grit to lay down smooth lines or paper that keep getting torn up. We’ve broken up our recommendations by our favorite pencils and pens. First, here is our recommendation for the best pencils for drawing tattoos. 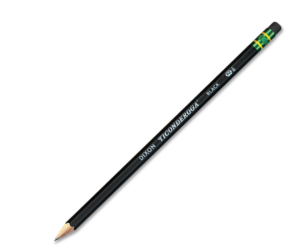 Hands down, our favorite pencil is the Dixon Ticonderoga pencil in black. Referred to as the world’s best pencil, this one in particular has an exclusive #2 HB graphite core lead formula. What does that mean exactly? You can expect a satin smooth black finish and performance each and every time you use it! Featuring the cool black barrel, this pencil is actually crafted from reforested quality cedar wood. Find it here for only $1.99! Now if you’re much more comfortable and feel your creative juices flow a lot better with a smooth pen, these are our recommendations for the best pens for drawing tattoos on paper. The Sakura Pigma Micron Ink Pens are smooth, skip-free drawing pens that lead to consistent lettering and lines each time you tap ink to paper. Depending on how fine you want your lines, you can choose nubs between 0.45mm (05) and 0.50 mm (08). In addition to their intense pigmentation, they’re also waterproof and permanent. If fine-point pens are your preference, you’ll really enjoy these! Also available in red ink:0.30mm (03) and 0.45 mm (05). Stenciling is a different game entirely. You need tracing pens, markers, and stencil and transfer paper that will ensure a smooth, crease-free transfer onto skin. Luckily, you don’t have to spend a lot to receive quality tattoo stencil-making products. Because how you decide to transfer drawing to skin is really a personal preference, you can choose to utilize duplicating carbon, hectograph ink and utilizing thermal copier machines. If you’re into using carbon paper or even free-handing directly onto the body, then trust these stencil tracing pens in black, blue and red. These don’t bleed, are smooth and really give you the freedom to free hand. When it comes to skin marking ink almost nothing compares to the Viscot Mini XL Markers with an ultrafine tip. 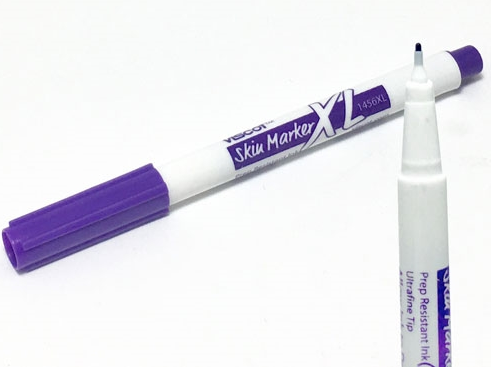 Because of its fine tip, you can create sharp, clear, long-lasting lines that stays visible up to 10 times longer than traditional ink skin markers (even after prepping the skin with common alcohol-based antiseptics). Lastly, we’re big fans of the thermal fax stencil paper by Spirit. 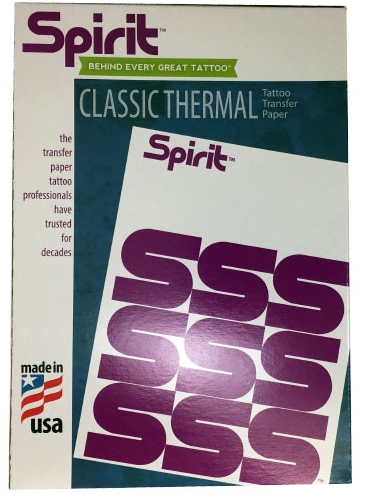 Officially called the ReproFX Spirit Thermal Tattoo Transfer Papers, these papers are available in a variety of lengths and sizes and its compatible with all thermal and fax-style burners. With 2, 5, 10, 25 and 100-sheet options in a package, this paper created with high-contrast pigments and stable waxes to product crisp, clean burns and clear transfer. This paper has really become an industry staple, so if you don’t currently own some—you’re missing out! We hope you’ve found this list of tattoo artist supplies helpful. Think of it as your back-to-school supplies list for the optimum tattoo drawing kit! Have your own recommendations? Comment below. Posted in Blogging, Product Reviews, Tattoo Art Supplies. Tagged tattoo art supplies, tattoo drawing supplies, tattoo sketch designs, tattoo stencils.